British foreign minister Jeremy Hunt said on Thursday he expects a lively debate in parliament around the government's soon-to-be-published Brexit policy, but that it offers a basis for talks to move forward in Brussels. Prime Minister Theresa May will set out a blueprint later on Thursday for what her government calls "a principled and practical Brexit", putting at its core a plan for a free trade area for goods that has angered many in her party. "You're going to have very, very lively debates in a situation like this. This is one of the biggest decisions that we have taken as a country in our political lifetimes so there's going to be a pretty fierce discussion but the prime minister has found a way forward," Hunt told reporters at a NATO summit in Brussels. 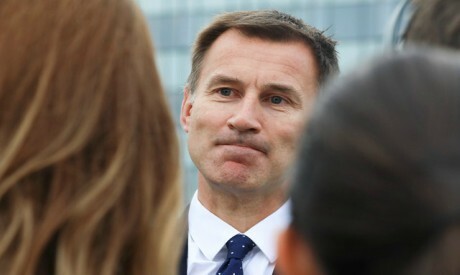 Hunt was appointed as foreign minister earlier this week after Boris Johnson, the face of Brexit for many Britons, resigned in protest at an outline of May's exit strategy saying it risked leaving Britain a "colony' of the EU. The NATO summit has seen Hunt, a former health minister more accustomed to regional hospitals than diplomatic dinners, introduced to US President Trump and thrown into the task of winning support for May's Brexit strategy from EU partners. "I've had very good discussions with my French, German and Dutch counterparts, many other counterparts here, explaining to them that this is the way we get that deep and special partnership with Europe," he said. Although May has agreed a Brexit strategy with her cabinet, and is prepared to face down dissent among her political party at home, the real test of whether it is a viable plan will be the reaction it receives in Brussels, where exit talks have all but stalled with less than nine months until Britain leaves. New Brexit minister Dominic Raab said that the Brexit blueprint should allay EU concerns about the proposals, and Hunt also said that the plan provided a way forward. "They had a lot of concern about, for example how we're going to avoid a hard border with Northern Ireland, whether it is possible to have frictionless trade without a customs union," Hunt said when asked what sort of reaction he had been getting. "What we've shown them is that that is possible. This is a very very significant step... I think we have the basis that we can move forward."